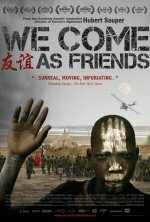 We Come As Friends release date was Friday, August 14, 2015. This was a New York release. Friday, August 21, 2015. This was a Limited in theaters release. A modern odyssey – a dizzying, almost science fiction-like journey into the heart of Africa. At the moment when the Sudan, the continent’s biggest country, is being divided into two nations, an old “civilizing” ideology re-emerges – one of colonialism and a clash of empires – with new episodes of bloody (and holy) wars over land and resources. Academy Award® nominated director of Darwin’s Nightmare, Hubert Sauper, takes us on a voyage in his tiny, self-made aircraft constructed from tin and canvas, leading us into the most improbable locations and into people’s thoughts and dreams in both stunning and heartbreaking ways. In English/ French/ Chinese/ Dinka/Nuer/Bari/Zanda. Release by BBC Worldwide North America.